Some of the older palmistry books declare that the Ring of Solomon is rare while more recent books state that it is quite common. I'm wondering what the experience regarding this is with some of our experts. Also I'm curious about the Ring when found in doubled form on both hands. Many thanks for shedding light on this. I noticed that many people took a look at your question, but unfortunately... so far nobody responded! Time to provide you at least an answer! 1 - Basically, I would recommend to discriminate a 'true' ring of Solomon (which has traditionally been recognised as sign of spiritual 'wisdom'), from a 'sympathy line', and a few other related variants: see the picture below! 2 - Second, I would also recommend to avoid making any interpretations for this line in isolation; and it is probably always very good to study the qualities of the heart line as well! For example, according Ghanshyam.Singh Birla describes that in Hasta Samudrika Shastra the 'Diksha Rekha' (also known as: 'sign of Yogi', see first picture above) is recognized as a triangle results from the combination of the ring of Solomon and a splitting heart line. But of course, it is important to recognize that this sign can only be found in a hand where the ring of Solomon interacts with the heart line resulting in a beautifully 'balanced' shape. NOTICE: This 'sign of Yogi' is very rare! So, the answer to your question ('common' or 'not common'?) really depends on what specific variant of the ring of Solomon one has in mind! Be aware: many people have in the palm below their index finger multiple horizontal lines (see the 3th variant in the picture). But formally those multiple lines can usually not be related to the 'true' ring of Solomon - which is actually quite rare - because in most hands the typical characterists of a 'true' ring of Solomon are missing! The 'sympathy line' (= a straight line) was e.g. described by David Brandon-Jones (1986). Finally... one more recommendation from William G. Benham - who recommended when considering the ring of Solomon, also check the quality of the head line (probably because one should not expect to find 'wisdom' in an individual who owns a confused mind!). Roberta, thank you for your question!! I dont think that 2nd and 3rd example given by you is belonged to ring of solomon. Because, it affects the success of the individual in association with heart line. but, i dont know specifically what does it mean. if this line cuts the heart line, there may be some difficulties at the time. indeed, it is blocking line. ( this secret i observed from a traditional palmist ) . But, it should not be classed as variant of 'ring of solomon'. because, those can be blocking line. The course of classic sign of solomon (either partial or complete) can be "only" classed as ring of solomon as per traditional palmistry. stalin.v wrote: ... The course of classic sign of solomon (either partial or complete) can be "only" classed as ring of solomon as per traditional palmistry. Sorry, but that is exactly what I described! I have not tried to describe 4 variants of the 'ring of Solomon': there is only one 'true' Ring of Solomon: see picture 2. Didn't you notice the names below the pictures? stalin.v wrote: ...if this line cuts the heart line, there may be some difficulties at the time. indeed, it is blocking line. ( this secret i observed from a traditional palmist). 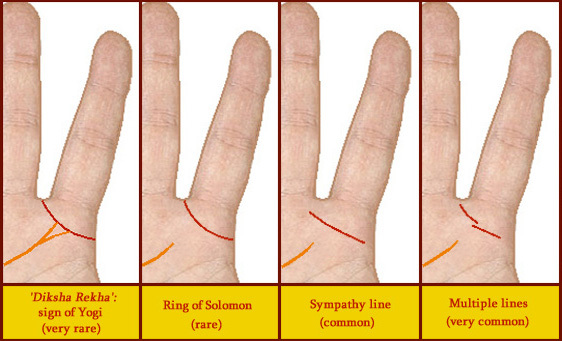 The ring of solomon can indeed be understood as a 'blocking line' - because it isolates the index finger from the rest of the hand (NOTICE: the index finger is associated with our 'ego'). I think a key-issue of the major hand lines is that in their best form they always show a slight curve which sort of follows the ridges of the skin. A likewise characteristic should be seen in a 'true' ring of Solomon! PS. My personal opinion is that a 'true' ring of Solomon can not be found in the lower zone of the mount of Jupiter... because in that lower zone it always BLOCKS all skin ridges. But it still does block the 'ego' - and therefore it may become... a 'sympathy line'! EXAMPLE: An incomplete 'ring of Solomon' (= the fine upper line within the blue marker) + a 'sympathy line' (= the thick lower line within the blue marker). Thanks so much for your crystal-clear elucidation regarding the ring of Solomon including the very helpful photos. All of this answers my question fully and you're a sweetie for taking the time to do this. I felt there should be more to this subject than the brief mentions that my books provide. Hi Roberta, thanks for your feedback!! By the way, would you like to share with us which book you are using? I have a couple of dozen palmistry books so far, some I like alot and others not so much. My top favorite is Johnny Fincham's The Spellbinding Power of Palmistry. His section on fingerprints alone was an ephiphany for me (and not in any "life purpose" kind of way). I find his interpretations of all hand features to be very accurate and thorough. Even though it's an older book I find Hutchinson's Your Life in Your Hands to be an excellent reference. Also Fitzherbert's Hand Psychology. I especially appreciate the line drawings of hands including the fingerprints as this provides additional depth to interpretations. God Given Glyphs by Jennifer Hirsch is great and highly recommended. I'm finally getting into Holtzman's Psychodiagnostic Chirology --tiny sips at a time-- and finding it fascinating. I'm always on the alert for worthwhile additions to my small collection of palmistry books (my other books are taking over the house). I love to explore new ideas and will certainly take them for a test drive but tend to discard anything with a whiff of snake oil. Thanks for all you do, Martijn. "The ring of Solomon, this is a rare line seen on the hand. It is a semi-circular line covering the mount of Jupiter or part of it. This line is usually seen between the fingers of Jupiter and Saturn and goes down towards the upper portion of the line of life and towards the upper portion of the line of life and towards the percussion. this line is named after the king Solomon, who was famous for his wisdom., generosity and his knowledge of the occult sciences. Sometimes this line is also seen by way of small lines from towards the end of the hand and running under the mount of Jupiter. in this case it looks like the same line as the union or the marriage line found in the mound of Mercury. The Possessor of this line is deeply interested in occult sciences and also in psychology. He acquires much in the psychic field. Such a person usually has square or spatulate tips with knotty joints. The ring of Solomon also indicates inclination towards spiritual; life. if there are two strong lines close to each other or the line gets a shape of a square or triangle, it is a good indication. A star attached to it is a mark of greatness." Thanks so much for sharing your helpful information. Much appreciated! i discovered through your website that i have the mark of the yogi (diksha rekha) as well as the ring of solomon on my right palm. Thanks for sharing your interesting report. Very nice to hear that my short presentation became useful for you. PS. I actually like that the 'diksha rekha' vocabulary is not specified any furter; because I am very aware that other aspects of the hand are required to confirm the spiritual nature in an individual. "I am very aware that other aspects of the hand are required to confirm the spiritual nature in an individual." Yeah, this is the point Martijin. Not only for for spiritual side but for money making side too. No line is absolute on the palms. Try to find why this line got formed on the palms you will find the answer elsewhere on the palm. This line also tells if a person has the ability to serve others for the betterment of mankind. It is a mark that commonly reveals the psychological nature of a person that can give up his own worldly attachments for a greater good. This is a sign of a healer. If other chirognomy indications be present –like Line of Intuition, small vertical lines on the Mount of Mercury and on the upper most phalanx of the Mercury finger, a Mystic Croix between the Heart and Head Line and a forked good Head Line-these signs indicate not only the love for the occult studies, but, the person will be proficient in the field. But, if the person who has these psychic markings on his palm along with square or spatulate hand, knotty fingers good deep forked Head Line, sufficient long finger of Jupiter with a strong will part of the thumb, he will earn, make money through his knowledge in this field and by suggesting solutions to their problems. This line gives the owner insight and psychic skills to look true things (the reality) behind the face of a person as the king Solomon could do. I think so the name of the line came in to being. His ESP (Extra Sensory Perception) is very much developed. He sometimes suddenly amazes everyone with some idea on something that nobody has ever thought of before. Generally, he is a generous person. Sometimes this line is found in ‘curved’ or ‘arched’ form and sometime in a straighter form. If the line is straighter then the person uses logic to convince people for his conclusions. The conclusions will be based on scientific studies and if the line is found curved or arched then he will use the imagination and emotion and intuition much to reach to his conclusions in occult studies. This is a very good and valuable line to possess and gives the owner the practical skills to know a person. I think, almost all psychic or the persons interested in occult sciences do have this sign on their palms. would luv to have a reading about the ring of solomon.. does my palm have that lines. . if so wat does that mean ..
rahultbahety wrote: would luv to have a reading about the ring of solomon.. does my palm have that lines. . if so wat does that mean .. Yes, you appear to have the Ring of Solomon particularly in your right hand, but most likely both. It adds empathy and people reading skills. thank you for the reading. does empathy means experience the feelings of another person? is people reading skills associated with psycologist. I would like to answer your question regarding the Diksha rekha. Diksha in sanskrit means "initiation" and "spiritual instruction". That's right. This name is given to the curved line surrounding the index finger. Although you or many others having this line might not have taken a formal initiation (diksha) under a spiritual guru,but still you have been in a way initiated into the spiritual world by Grace. Diksha means ---Henceforth you will live a spiritual life following the guru's command. The Guru may or may not be physically present, but we are all guided by higher beings whenever we have a positive and a progressive mindset. You could be staying in a commune, ashram, monastery, nunnery, in seclusion or living with the family fulfilling your duties while disciplining yourself through spiritual practices which could lead you to final emancipation in this lifetime or the following lives. You are the disciple as well as the teacher. The guru tattwa or the essence of the guru is within you. People who have little interest in spirituality do not have a diksha rekha. They may have the common ring of solomon and are interested in psychology, occult sciences etc. In order to lead a spiritual life one needs to have a general knowlede in psychology and occult (not neccessarily technical) . Diksha means an initiation into renunciation (vairagya) as well. One also needs to have other lines and marks also. And that is the power of discrimination (viveka) which is indicated by the quality of the Headline. Viveka and vairagya are the two foundation pillars. Renunciation does not mean you have to leave everything a nd stay in the mountains or forest. One can even live amongst people and yet be untainted like the lotus flower which grows in muddy water yet is unstained. Therefore a true Diksha rekha is the one shown in the first illustration by Martijn. What could be interpreted if one has an island on the middle of the " ring of solomon " formed by the double lines ? Does that mean that the person is not able to cope up with the situation at that period of time ? In the case of a double line of ring of solomon crossed by 2 lines of a forked heart line, gives us the the Teacher's Square, or is the teacher's square a separate mark on the Jupiter mount area ? What do you mean by formed by double lines? Is the Ring of Solomon made of 2 lines...and within this formation there is an island? Hope I am making it clear........The second image shows a square formed with broken lines, this is the type I am referring to, although the type which I have seen is not a broken one. And also, the square formed in this palm is quite large and prominent........so is it a Teacher's square or there is nothing like teacher's square at all ? Or Squares are not all that important ? Marigold, it is a teacher's square and is formed by the raising lines from the head line and not from the branches of the heart line. The square in your palm is not prominent as the vertical lines are faint. For others knowledge-- When there was an island, I was not able to cope up with the situation in my life temporarily, but now things have changed and so the dissolution of the island has taken place. Hope this is helpful to whoever interested.